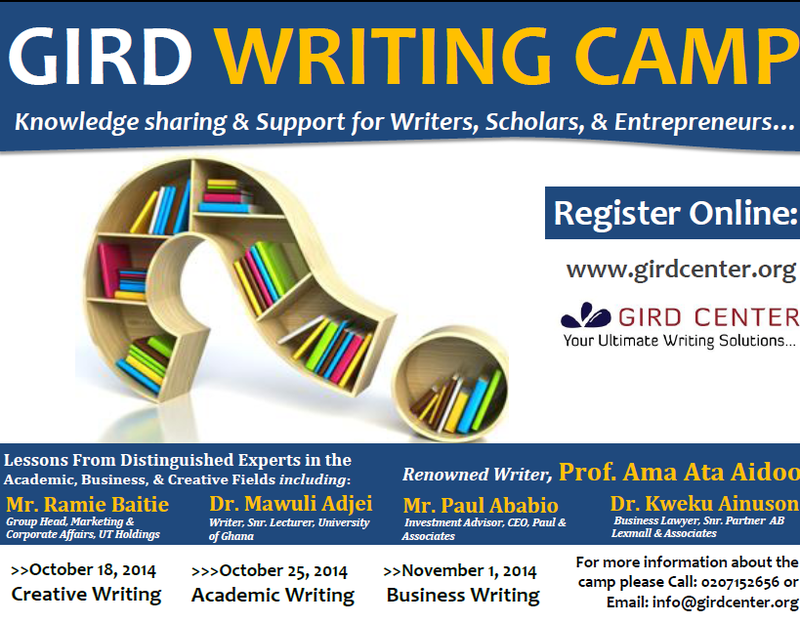 The Gird Writing Camp, a two-tiered interactive writing program that supports young writers, scholars, and entrepreneurs with knowledge and tools to develop and enhance their writing skills is now open for registration. The Camp comprises a one-day intensive seminar and a month long writing consultancy package that enables participants to get access to writing experts in confronting personal writing challenges. Participants will get the support of diverse experts in the business, academic, and creative writing fields including: Prof Ama Ata Aidoo, renowned writer; Dr. Mawuli Adjei, Senior Lecturer, Department of English, University of Ghana and Mr. Rami Baitie, Group Head, Marketing and Corporate Affairs, UT Holdings, Mr. Paul Ababio, Investment Advisor, CEO, Paul & Associates and Dr. Kweku Ainuson. Business Lawyer, Snr. Partner AB Lexmall & Associates.